By Matt Dominguez The Idaho dairy industry received another self-inflicted black eye recently after a confidential memo from the United Dairymen was leaked to the media. In it, dairy producers are urged not to allow journalists access to their facilities. It goes on to explain that reporters are increasingly interested in the industry's questionable production methods because of the restrictions imposed by the state's notorious ag-gag legislation. That law-pushed by the dairy industry earlier this year-was designed to stop reporters and whistleblowing employees from exposing crimes in agricultural facilities. Idaho's ag-gag law was instigated by an investigation by Mercy For Animals at Idaho's largest milk company, Bettencourt Dairies. 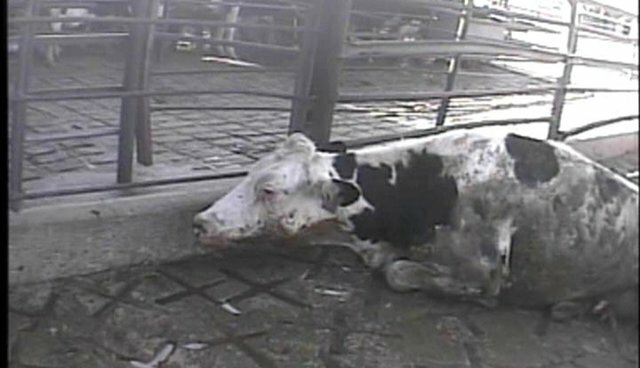 The video footage showed company officials viciously beating, shocking and sexually abusing dairy cows. The cruelty drew nationwide attention and condemnation. But rather than taking meaningful steps to improve animal welfare, the dairy producers are instead trying to silence whistleblowers. The subsequent ag-gag law passed by state lawmakers is designed to punish any courageous person who dares to document similar crimes with jail time. The footage that was collected is graphic in nature, featuring violent images of mistreated animals. You can view parts of it in this HSUS commercial via YouTube. For nearly two years, millions of Americans who care about food safety, animal welfare and the environment were on a winning streak. In state after state, they beat back more than twenty similar ag-gag legislative bills that had been pushed by animal agribusiness in an attempt to keep the public in the dark. One would think Idaho's dairy industry would be eager to make meaningful reforms after the negative light cast over it by the ag-gag controversy. Instead, this memo is further evidence that dairy executives have decided to stick with their flawed strategy of doing whatever it takes to keep consumers in the dark about what is happening on Idaho's dairy factory farms. Consumers increasingly want food that was produced responsibly, with respect for workers, the environment and animals. Thanks to Idaho's dairy companies, all food producers in that state take on the stigma of operating in a shadowy "ag-gag" state. After the cruelty exposed in Idaho, and the legislators' rush to help the industry silence its critics, what will be the lasting impression of Idaho agriculture? Ag-gag bills have rightfully become a PR nightmare for animal agriculture. The National Pork Producers Council noted, "[w]e did a study of coverage of 'ag-gag' laws that found that 99 percent of the stories about it were negative [for the industry]." Hopefully as more of Idaho's sustainable food producers and citizens who have expressed opposition are heard, the legislature will repeal this draconian law and begin to undo some of the harm they've caused. Until then, Idaho will continue to be looked at as embarrassing outlier. And the blame lies squarely at the feet of the dairy industry. Matt Dominguez is the Farm Animal Protection Public Policy Manager for The Humane Society of the United States. Follow him on Twitter at @Matt_Dominguez.